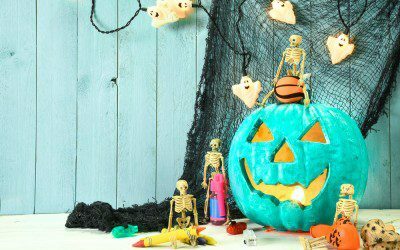 Halloween is on its way, and while the holiday is eagerly anticipated by many children, for those with diabetes and other dietary restrictions, it can be an occasion for worry. That’s because much of the candy handed out to trick-or-treaters on All Hallows’ Eve is off-limits for children who must carefully control their blood sugar levels or who have allergies or autoimmune reactions (such as celiac disease) to certain foods. That’s where the Food Allergy Research & Education (FARE) Teal Pumpkin Project comes in. Founded by a mother in Tennessee, the movement aims to ensure that “all children will come home on Halloween night with something they can enjoy.” To participate, households provide non-food treats — such as bubbles, crayons, bookmarks, or stickers — to trick-or-treaters and display a teal pumpkin to indicate that these goodies are available. Free, printable signs are available for download on the Teal Pumpkin Project website. To learn more about the initiative, and to see additional suggestions for treats to hand out, visit the Teal Pumpkin Project site.